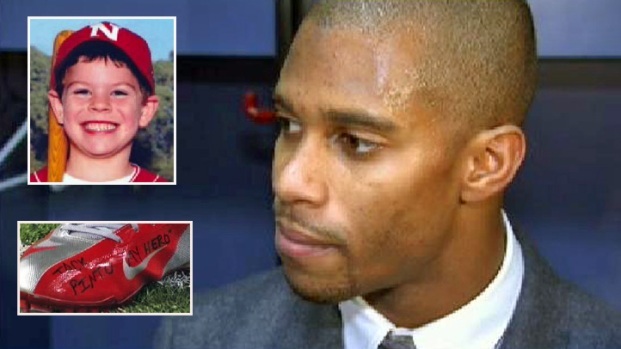 For much of his hour-long visit with the family of a 6-year-old boy killed in the Connecticut school shootings, Victor Cruz talked about football, life and young Jack, the child who idolized him. Tears were shed. Feelings were shared. Cleats and gloves worn by Cruz to honor Jack Pinto at Sunday's game against Atlanta were given to his family. 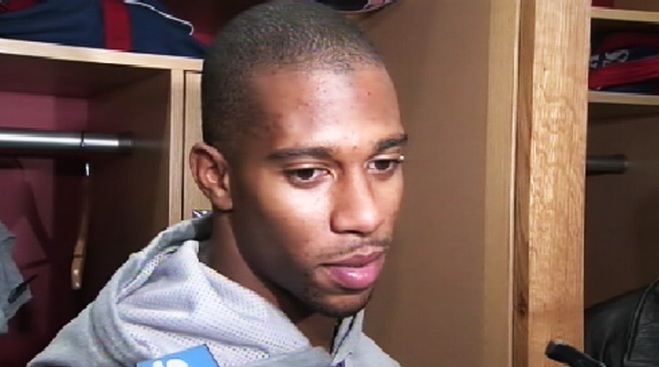 The Giants wide receiver somberly recounted Wednesday his meeting with Pinto's parents and brother in Newtown, Conn.
Giants wide receiver Victor Cruz talks about how he honored 6-year-old Jack Pinto, one of the 20 children killed in the Newtown, Conn., school shooting rampage, during Sunday's game. Cruz wrote in marker on his shoe that Pinto was his hero, and dedicated the game to the slain boy. The 26-year-old player best known for his salsa dances after touchdowns signed autographs for the children before heading inside. "Hopefully some of their grief might at least temporarily be suspended in being able to embrace Victor Cruz," Coughlin said.